According to Mr. Dorsey, the most significant pattern to watch for is a “reversal bulge.” A reversal bulge occurs when a 25-period Mass Index rises above 27.0 and subsequently falls below 26.5. A reversal in price is then likely. The overall price trend (i.e., trending or trading range) is unimportant. 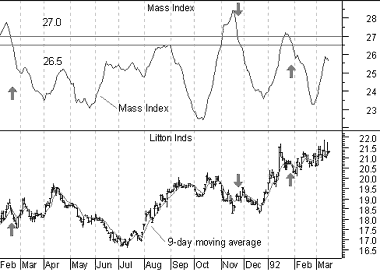 A 9-day exponential moving average is plotted on top of Litton’s prices. I drew arrows when a reversal bulge occurred (i.e., the Mass Index rose above 27 and then fell below 26.5). If the 9-day moving average was falling, I drew a “buy” arrow. If the 9-day moving average was rising, I drew a “sell” arrow. Calculate a 9-day exponential moving average (“EMA”) of the difference between the high and low.